Personalized Cosmic Sigil Talisman Ring - A Unique One of a Kind Jewel that you Won't find Anywhere Else!! I am very excited to share with you the Personalized Cosmic Sigil Talisman Ring - A genuine, one of a kind, which is created based on Astral Magic principals of the Hermetic tradition. Just like our Personalized Cosmic Sigil Talisman. 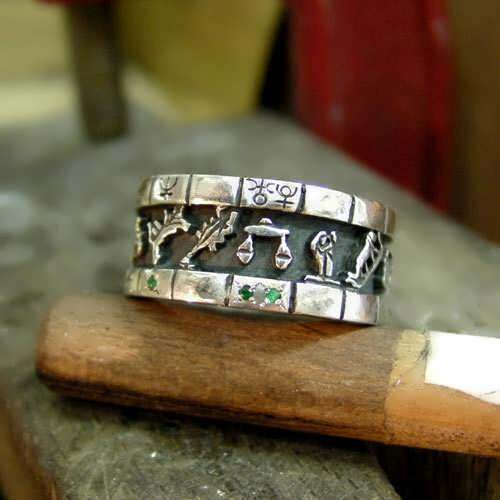 Since the creation of the cosmic sigil we have been looking for a way to recreate it as a genuine magic ring. 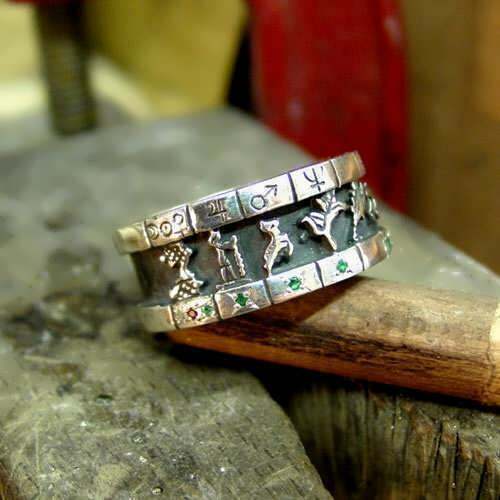 A one of a kind Talismanic ring that is designed to capture complex astrological energies that modify, balance and strengthen your unique inherent potentials. 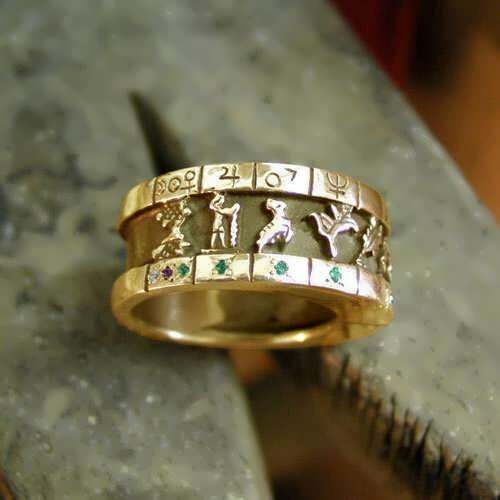 so together with our Astrologer Michael Ofek we're reviving the lost art of creating powerful personalized Talismans. 1. As a unique remedial Talisman, individually designed, based on the birth chart of the wearer, with the planetary placements and configurations that are the most empowering and balancing (the astrological considerations are also given in writing). 2. As a Talisman for the solar return of the person (when the sun is at the degree of the natal sun, thus reinforcing its solar potential) with the birth chart as the image. this can be a beautiful birthday present. *this category is only available for the solar return times that fall between our working hours. 3. As an image of the birth chart. this can be based on the solar or lunar (plus ascendent) return time. or even without it being a Talisman made at a specific moment, yet with the symbolic power of the reflection (like cures like) of one with his natal chart. 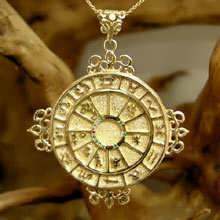 At the time of ordering the Talisman, you will send us your date, time and place of birth as accurate as possible, and your category of choice from the list above. Our in-house astrologer - Michael Ofek prepares your birth chart for the Talisman. For the first category - remedial Talisman, Michael analyzes the chart to find the exact time that the configuration of the planets is in it's most balancing, empowering and strengthening state in correlation with your birth chart. I will assemble the Talisman (and magically consecrate it) at that exact point in time, In this celestial window of opportunities that stress your full potential and help resolve difficult combinations. 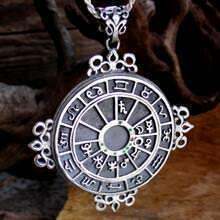 The design of the Talisman is a figure of an astrological chart, this serves as a symbolic mirror image of the solar system in relation to earth in the time and place of its making, or the time and place of the birth of a person. The metals chosen in this Talisman are not specific because we are invoking the whole planetary picture, It is made of silver or gold, the metal of the two Lights which are the general rulers of the life as a whole. Silver is a lunar protective metal, and as the lunar principle in astrology is the matrix by which all planetary powers flow forth to the sub-lunar sphere (earth and its atmosphere), so it is symbolic of the energy that binds and connects all the others together. Gold represents the Sun and the creative force of the spirit therefore reinforcing the solar unifying principle of life. On one side of the ring - the houses (whole sign house system) are marked with a special engraving of the planets placed inside them according your category of choice, in the remedial Talisman the placement of the planets will be according to the chart of the elected time, otherwise it will be according to the birth chart. 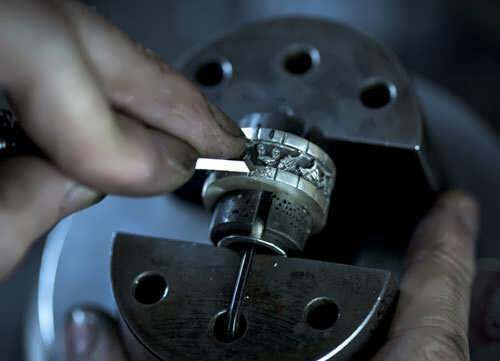 On the other side of the ring - gems are embedded that represent the exact placement of the Planets (Ruby for The Sun, Diamond for The Moon and Emerald for the planets).